The harsh cold weather is not letting us slip on to spring jackets and light clothes. It is contrary that in Spring you have to wear boots and thick coats to keep warm. You have to go along with what nature brings in. That being said, the food you consume should be apt for the weather. Soups are the comforting food of my family during winter, hence my next recipe is a soup again. 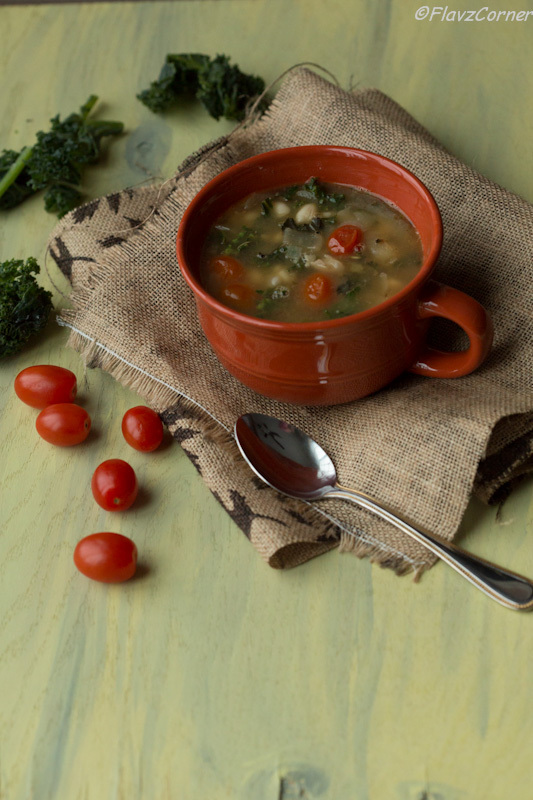 Kale Navy Bean Soup is a simple soup that is very mild in flavors. One of the best aspects of this soup is that you don't need any canned broth especially when you are concerned about those BPA coated cans. 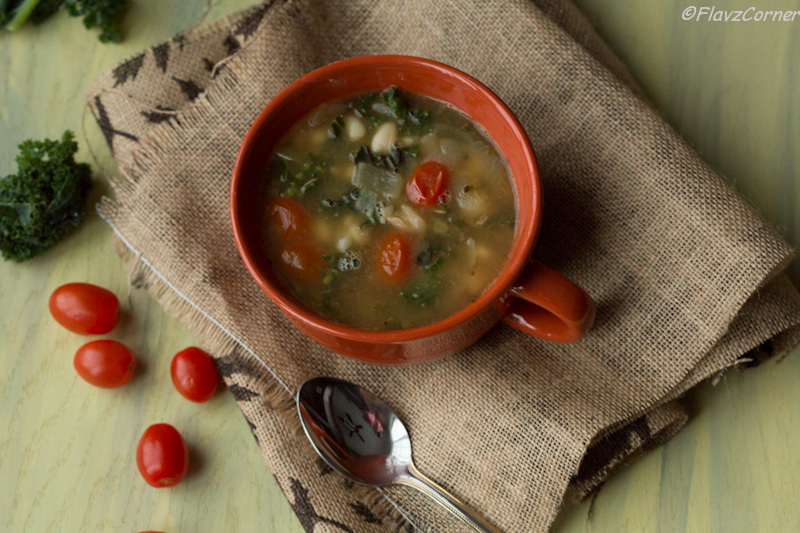 Another plus point of this simple soup is that it uses kale. Kale, also known as borecole is one of the top rated super food. Kale is also regarded as the 'Queen of Greens'. These green leaves are popular for their exceptional nutrition and health benefits. They belong to the cruciferous family such as Cabbage, Collards, Broccoli, and Brussels sprouts. These nutritional powerhouse are packed with calcium, vitamin B6, magnesium, vitamin A, vitamin C, and vitamin K. It is also a good source of minerals like copper, potassium, iron, manganese, and phosphorus. Kale helps to reduce the risk of cancer and lowers cholesterol. Kale doesn't have any bitter taste, so I include them in dishes and soups knowing that I am serving something healthy for my family. Soaking 1 1/2 cup of dry beans will yield 4 cups of beans. Pressure cook the beans with 3 cups of water and a pinch of salt till 3 whistle blows. Keep them aside till the pressure subsides. Take one cup of the cooked beans, add 1/2 cup of water and grind them into a smooth paste. Take a sauce pan and cook the minced garlic in 2 tsp of olive oil till light golden brown. Add the chopped onions, herbs, salt and pepper and cook till onions are translucent. Cook the chopped kale for 2 -3 minutes or until they are wilted. Add cherry tomatoes and cover and cook for 2 more minutes. Now add the cooked beans, beans paste, chopped basil and 3 cups of water and cook for 15 minutes or till the flavors are well blended. Serve them hot with pull apart bread. Nice clicks and lovely soup Shibi. Great soup! I make something similar - I truly love dark greens in soup of any kind, but particularly in a bean soup. Our weather has been cold, too - we had 10 inches of snow over the weekend! Which my wife and I got to shovel, lucky us. It's melting quickly, though - I need to get my garden in. I'll be planting kale, of course! 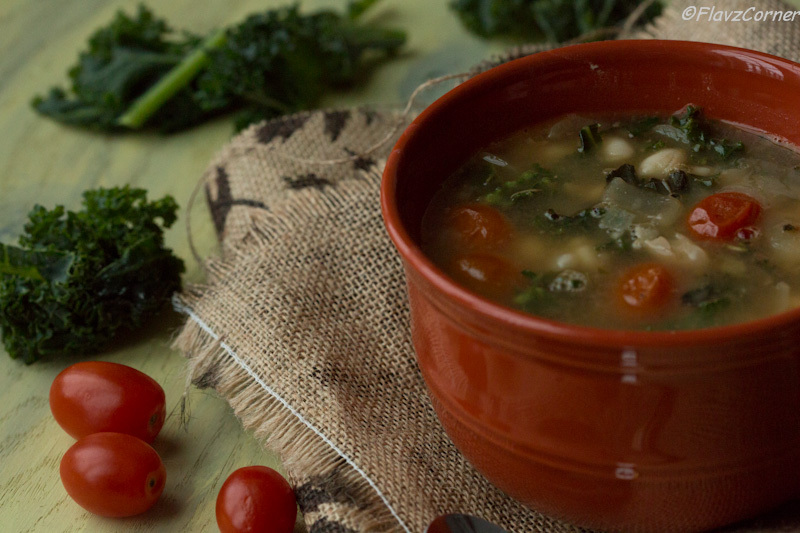 This soup is truly perfect for the remaining days of winter! Love that it's so healthy and uses only natural ingredients, awesome! never heard of Navy beans :-) love these simple broth based soups! Navy beans are the white beans we get at the grocery stores. Great northern beans is a variety of Navy beans which you can easily find at the Goya section of grocery stores. I use the dry beans. They are also avaiable in cans. We had such a blessed Easter. Hope you move is going smoothly. Great soup. Haven't tried Kale.